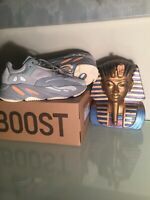 BRAND NEW IN BOX ADIDAS YEEZY BOOST 700 ‘Inertia’ Size 5. New In box With Tags. ADIDAS YEEZY BOOST 350 V2 SEMI-FROZEN YELLOW ZEBRA B37572 SPLY - TRUSTED SELLER!